One more thing before we discuss the tandem house. Once we graduated in May 2014 we moved back into the Wyandot House. It was nice to be done with school; both have jobs and getting income. We had fun entertaining friends and family, hosting dinner and having bbq’s and simply enjoying the house. We built a fence to close in the backyard, painted a handful of rooms, did a lot of yard work and re-surfaced the front porch. And although we were enjoying living and taking care of our home, our minds were getting a little restless since not much can keep you as busy as graduate school. Our dinner conversations began centering on the opportunities and scenarios surrounding the Wyandot House, the goals we had as a couple, and the short-term decisions that would need to be made in order to pay student loans when they came due in the next few months. 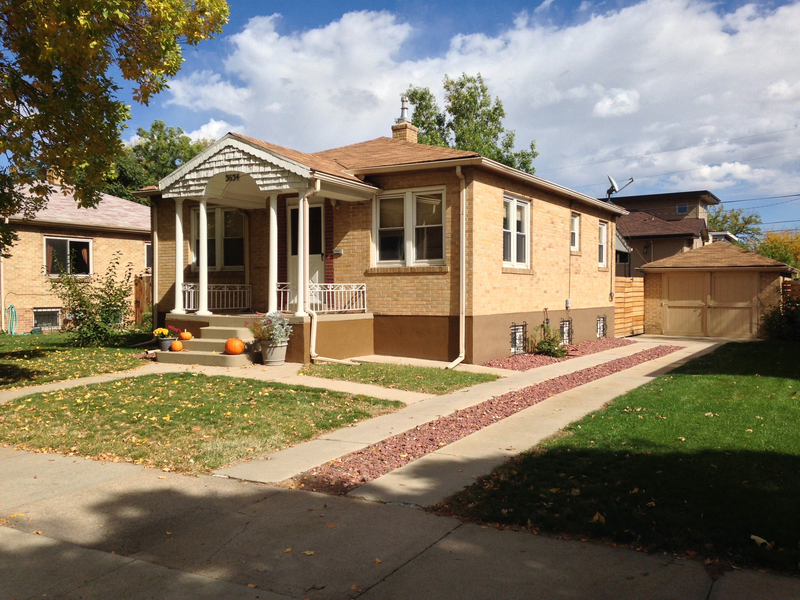 We concluded that although we enjoyed the house and the neighborhood, the smartest thing to do was either sell the house and take advantage of offers we were getting from developers or rent it out and reap the benefits of unprecedented rental rates in Denver. We decided we would rent the house again. It would be a win-win situation for us to get rental income; enough to pay the mortgage and cover our monthly student loan payments. Plus, we still got to dream about the potentials of what we could eventually do with the house/lot when the time came. The only problem now was that we had nowhere else to live. Our solution: Buy another house. Given everything we knew about zoning in Denver, the ongoing build-out of transit lines and designated “areas of change” we knew we were looking for an investment. We didn’t need to find our “forever” home. Instead, our criteria were to find a place that would gain value while we were there, would be an easy commute to work and a house that would be comfortable enough to live in even if we chose not to do anything to it. 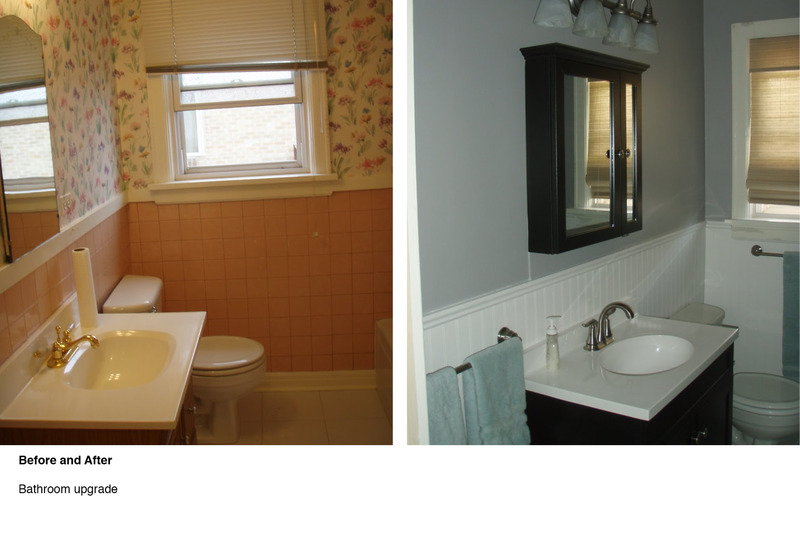 To our real estate agent, we were not the typical clients with a laundry list of must-haves in a home (i.e. 3 bedrooms, 2 baths, garage, etc.). Instead, we told our agent the neighborhoods we were interested in based off of the highest expected year-over-year growth rate, being near new/expected transit stations, near new development, oh and… it had to be a lot zoned for two units. Easy right? Not so easy, in fact. The reality was that Denver’s housing inventory was low because during the recession (2008-2011) no houses were being built. On top of that, it was 2014 and Denver was experiencing an oil and tech boom. There has been unprecedented population growth in the past few years and all those people moving to Denver were, and still are, looking to buy a home. On top of that, it was hard for first-time homebuyers to get financing contrary to developers that have cash and the incentive to build. The result, high demand for whatever was out there. In a matter of days on the market, houses had multiple offers and were being sold for well over asking price. We didn’t know how bad it was until we started looking. Our dilemma was that there was little on the market in our price range, so much so, that we would go weeks without seeing anything new on the market. To be honest we were a little discouraged. It was September now and our goal was to rent the Wyandot House by November. The timing was getting tight. Our thoughts were definitely stuck on house searching and checking the MLS (real estate website) on an hourly basis it seemed. But come to find out Scott’s mind was focused on something else. We had scheduled a weekend getaway to Telluride to celebrate being done with school, or so I thought. Much to my surprise, he ended up proposing while horseback riding with Roudy (highly recommended)! That was an adventure, to say the least. It was an amazing escape to the mountains and when we came back we were so happy and even more motivated to buy a new house together. However, reality set in, we realized we were going to have to pay for a wedding! On top of that, we were still not having any luck in our house search. I remember the night we had a conversation and decided that we were being too ambitious to buy a new home and that we had it pretty good at the Wyandot House the way things were. We decided that it was best for us to stay put and enjoy our engagement, the timing just wasn’t right…. A few days later Scott sent me a listing for a home in West Colfax, a neighborhood in Denver that was at the top of our search list. The house had been listed that morning and we knew we had to get over and take a look. Why were we so excited before we even saw it? It was zoned two-unit, was across the street from a new light rail station and near the new St. Anthony’s redevelopment. It met all the criteria we were looking for and more. So when we walked into the house we barely needed to look around before we knew we had to put down an offer. We did. And although it wasn’t an easy process (almost losing the house to a developer’s all-cash offer) we got the house! Within two weeks we had the Wyandot House rented and moved into the new place in time to hand out candy on Halloween. It’s hard to believe we now own two homes zoned two-unit. At the time we didn’t know for sure if we would do anything with it but we knew one thing, that the homes we had were good investments and they gave us options. So what is Tandem House? We’ll hold off on that topic for now and I’ll give you the back-story that starts with the “Wyandot House”. Considering that if it weren’t for “Wyandot House” we wouldn’t be talking about the Tandem House and therefore there would be no blog. 3634 Wyandot was purchased in 2009 and over the next 6 years, it would become a lifeline for both of us. This was Scott’s first big investment when he was single and it turned out to be a good one. At the time the economy was still in a slump and LoHi was an unassuming neighborhood to live, let alone invest in. Not only has this house become a home but it has also helped pay the bills through each life transition. When Scott was single without a job he was able to get a roommate to help cover the mortgage and that continued through his first year of architecture school. In 2011 as the market started to rebound, home values in the neighborhood started to rise and rental home demand was up. Scott saw the potential in renting the home out to pay the mortgage and school tuition. Around this time was when Scott and I met and since then we have watched this neighborhood change before our eyes. 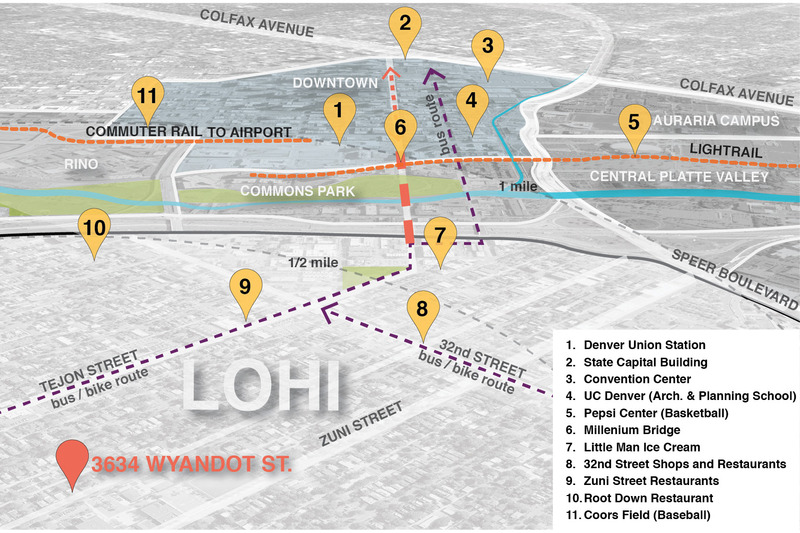 In parallel with our school curriculum in Architecture and Urban Planning, we both became hyper-aware of what was going on not only in LoHi but also in the greater Denver area. We started to be flooded with information from all angles that revealed the potential of our property and that is when we started dreaming together. Here’s some of the information we have comprehended over the years that has kept our imagination evolving. While in school Scott and I were taking classes like “The Form and Formation of Cities”, “Land Development and Regulation” and “Urban Real Estate”. In congruence with this curriculum, we were lucky enough to go to school in the heart of Downtown Denver, making this city our learning lab. Everything we absorbed in school related to what we were seeing happen in Denver during an unprecedented development boom. This kind of surge hadn’t been seen since the “Imagine a Great City” era under Mayor Pena (1983-1992) when the Central Platte Valley was transformed; railroad tracks were consolidated making room for Elitch Gardens Amusement Park, a new Convention Center was built and the Rockies were recruited to their new baseball stadium, Coors Field in Lower Downtown (LoDo). All these things were visionary and important to making Denver a “World Class City”. Now 20 years later, we found ourselves not only studying urban development but also watching the next big wave of investment in our city happen before us. This time it was around historic Union Station and the build-out of the transit system. We quickly realized that by owning real estate so close to downtown and Union Station that we would reap the benefits. But we also realized that this kind of growth didn’t just happen, that there was an incentive for the growth to happen where it was, in places like LoHi and the trendy RiNo neighborhood in Denver. LoHi had always been there, but why now did everyone want to develop and live in this area? That reason is Zoning. If you remember, Scott bought the Wyandot house in 2009 and come to find out Denver’s Zoning Code that hadn’t been revised since 1956, was updated one year after he bought it, in 2010. Wyandot went from being zoned R-1 to U-TU-B. Now it was possible to put two homes on our lot when only one was previously allowed. Many people would say, “so what… we like the house we live in and don’t see the value added.” It’s definitely not appealing to the average person and at first, we didn’t care about it, until it started to affect us. It turns out that the new zoning was a long time in the making. It began to orchestrate in 2002 with Blueprint Denver and it was that visioning, which got implemented in the new Zoning Code and went into effect in June 2010. The goal of Blueprint Denver was to adopt the idea of “New Urbanism.” Rethinking the way our city was growing and also sprawling into suburbs because of the car. The result is separated land uses where people find themselves driving from one parking lot to the next and sitting in traffic all day. Instead, city planners were opting to think in the way we built cities in the 1920s. When cities were built around transportation hubs and the land-uses around them were diverse with housing, work, parks, and entertainment within walking distance of each other. New Urbanism promotes increased use of trains and light rail, instead of more highways and roads. What came out of Blueprint Denver was a popular map that designates areas of Denver as either an “Area of Change” or an “Area of Stability”. Ultimately this is what informed the new zoning code. Much of LoHi is designated as an “Area of Change”. It’s a place where the City believes that growth and Density are necessary to create the walkability and access that is characteristic of a great city. So why am I giving you the lengthy background information? Well, it simply just explains why when we walk Rio (our too smart for his own good Australian Shepherd) around the neighborhood, we see every other house with orange fencing around the trees and temporary dumpsters in the streets that create even less street parking! And although we are not fond of the ugly stick build duplexes popping up everywhere, it explains why on a weekly basis we get letters in the mail from developers wanting to buy our house. It explains why they are offering well over what the house is actually worth because the simple fact is it’s a chance to make a pretty penny. The land is worth more than the house so developers buy one house for $450k, build two houses on the same lot, and sell each for $700-850k and Voila! It’s a simple equation to make money.